Activated carbon (also called active carbon, activated charcoal, or activated coal) is a form of carbon that has been processed to make it extremely porous and thus to have a very large surface area available for adsorption and chemical reactions. It is usually derived from charcoal. Activated carbon is valuable for a variety of applications. Examples include gas purification, water purification, metal extraction, gold recovery, medicine, sewage treatment, air filters in gas masks and filter masks, and filters in compressed air. In addition, activated carbon is useful for the deodorization of closed spaces such as refrigerators and warehouses. Sufficient activation for useful applications may come solely from the high surface area, though further chemical treatment often enhances the adsorption ability of the material. Activation/Oxidation: Raw material or carbonised material is exposed to oxidizing atmospheres (carbon dioxide, oxygen, or steam) at temperatures above 250 °C, usually in the temperature range of 600-1200 °C. Chemical activation: Impregnation with chemicals such as acids like phosphoric acid or bases like potassium hydroxide, sodium hydroxide or salts like zinc chloride, followed by carbonization at temperatures in the range of 450-900 °C. It is believed that the carbonization / activation step proceeds simultaneously with the chemical activation. This technique can be problematic in some cases, because, for example, zinc trace residues may remain in the end product. However, chemical activation is preferred over physical activation owing to the lower temperatures and shorter time needed for activating material. Activated carbons are complex products that are difficult to classify on the basis of their behavior, surface characteristics, and preparation methods. However, some broad classification is made for general purpose based on their physical characteristics. Traditionally, active carbons are made in particular form as powders or fine granules less than 1.0 mm in size with an average diameter between .15 and .25 mm. Thus they present a large surface-to-volume ratio with a small diffusion distance. PAC is made up of crushed or ground carbon particles, 95–100 percent of which will pass through a designated mesh sieve or sieve. Granular activated carbon is defined as the activated carbon being retained on a 50-mesh sieve (0.297 mm) and PAC material as finer material, while ASTM classifies particle sizes corresponding to an 80-mesh sieve (0.177 mm) and smaller as PAC. PAC is not commonly used in a dedicated vessel, owing to the high headloss that would occur. PAC is generally added directly to other process units, such as raw water intakes, rapid mix basins, clarifiers, and gravity filters. Granular activated carbon has a relatively larger particle size compared to powdered activated carbon and consequently, presents a smaller external surface. Diffusion of the adsorbate is thus an important factor. These carbons are therefore preferred for all adsorption of gases and vapors as their rate of diffusion are faster. Granulated carbons are used for water treatment, deodorization and separation of components of flow system. GAC can be either in the granular form or extruded. GAC is designated by sizes such as 8x20, 20x40, or 8x30 for liquid phase applications and 4x6, 4x8 or 4x10 for vapor phase applications. A 20x40 carbon is made of particles that will pass through a U.S. Standard Mesh Size No. 20 sieve (0.84 mm) (generally specified as 85 percent passing) but be retained on a U.S. Standard Mesh Size No. 40 sieve (0.42 mm) (generally specified as 95 percent retained). AWWA (1992) B604 uses the 50-mesh sieve (0.297 mm) as the minimum GAC size. The most popular aqueous phase carbons are the 12x40 and 8x30 sizes because they have a good balance of size, surface area, and headloss characteristics. Consists of extruded and cylindrical shaped activated carbon with diameters from 0.8 to 45 mm. These are mainly used for gas phase applications because of their low pressure drop, high mechanical strength and low dust content. Porous carbons containing several types of inorganic impregnant such as iodine, silver, cation such as Al, Mn, Zn, Fe, Li, Ca have also been prepared for specific application in air pollution control especially in museums and galleries. Due to antimicrobial/antiseptic properties, silver loaded activated carbon is used as an adsorbent for purifications of domestic water. Drinking water can be obtained from natural water by treating the natural water with a mixture of activated carbon and flocculating agent Al(OH)3. Impregnated carbons are also used for the adsorption of H2S and mercaptans. Adsorption rates for H2S as high as 50 percent by weight have been reported. Porous carbon material can be coated with a biocompatible polymer to give a smooth and permeable coat without blocking the pores. The resulting carbon is useful for hemoperfusion. Hemoperfusion is a treatment technique in which large volumes of the patient's blood are passed over an adsorbent substance in order to remove toxic substances from the blood. 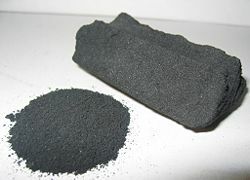 Activated carbon is also available in special forms such as cloths and fibers. On account of its high degree of microporosity, a single gram (g) of activated carbon can have a surface area in excess of 500 square meters (m²), with 1500 m² being readily achievable. The surface area is typically determined by nitrogen gas adsorption. By way of comparison, a tennis court surface is about 260 m². Carbon aerogels, while more expensive, have even higher surface areas and are used in special applications. Under an electron microscope, the high surface-area structures of activated carbon are revealed. Individual particles are intensely convoluted and display various kinds of porosity; there may be many areas where flat surfaces of graphite-like material run parallel to each other, separated by only a few nanometers or so. These micropores provide superb conditions for adsorption to occur, since adsorbing material can interact with many surfaces simultaneously. Tests of adsorption behavior are usually done with nitrogen gas at 77 K under high vacuum, but in everyday terms activated carbon is perfectly capable of producing the equivalent, by adsorption from its environment, liquid water from steam at 100 °C and a pressure of 1/10,000 of an atmosphere. Activated carbon does not bind well to certain chemicals, including alcohols, glycols, ammonia, strong acids and bases, metals and most inorganics, such as lithium, sodium, iron, lead, arsenic, fluorine, and boric acid. Activated carbon does absorb iodine very well and in fact the iodine number, mg/g, (ASTM D28 Standard Method test) is used as an indication of total surface area. Activated carbon can be used as a substrate for the application of various chemicals to improve its capacity to adsorb some inorganic (and organic) compounds, such as hydrogen sulfide (H2S), ammonia (NH3), formaldehyde (HCOH), mercury (Hg), and the radioisotope iodine-131 (131I). This property is known as chemisorption. Many carbons preferentially adsorb small molecules. Iodine number is the most fundamental parameter used to characterize activated carbon performance. It is a measure of activity level (higher number indicates higher degree of activation), often reported in mg/g (typical range 500-1200 mg/g). It is a measure of the micropore content of the activated carbon (0 to 20 Å, or up to 2 nm) by adsorption of iodine from solution. It is equivalent to surface area of activated carbon between 900 m²/g and 1100 m²/g. It is the standard measure for liquid phase applications. Iodine number is defined as the number of milligrams of iodine adsorbed by one gram of carbon when the iodine concentration in the residual filtrate is 0.02 normal. Basically, iodine number is a measure of the iodine adsorbed in the pores and, as such, is an indication of the pore volume available in the activated carbon of interest. Typically, water treatment carbons have iodine numbers ranging from 600 to 1100. Frequently, this parameter is used to determine the degree of exhaustion of a carbon in use. However, this practice should be viewed with caution as chemical interactions with the adsorbate may affect the iodine uptake giving false results. Thus, the use of iodine number as a measure of the degree of exhaustion of a carbon bed can only be recommended if it has been shown to be free of chemical interactions with adsorbates and if an experimental correlation between iodine number and the degree of exhaustion has been determined for the particular application. Some carbons are more adept at adsorbing large molecules. Molasses number or molasses efficiency is a measure of the macropore content of the activated carbon (greater than 20 Å, or larger than 2 nm) by adsorption of molasses from solution. A high molasses number indicates a high adsorption of big molecules (range 95-600). Molasses efficiency is reported as a percentage (range 40-185 percent) and parallels molasses number (600 = 185 percent, 425 = 85 percent). The European molasses number (range 525-110) is inversely related to the North American molasses number. Tannins are a mixture of large- and medium-sized molecules. Carbons with a combination of macropores and mesopores adsorb tannins. The ability of a carbon to adsorb tannins is reported in parts per million concentration (range 200 ppm-362 ppm). Some carbons have a mesopore structure which adsorbs medium size molecules, such as the dye Methylene Blue. Methylene Blue adsorption is reported in g/100g (range 11-28 g/100g). It is a measure of the activated carbon’s resistance to attrition. It is an important indicator of activated carbon to maintain its physical integrity and withstand frictional forces imposed by backwashing and so forth. There are large differences in the hardness of activated carbons, depending on the raw material and activity level. Ash content reduces the overall activity of activated carbon, and it reduces the efficiency of reactivation. The metals (Fe2O3) can leach out of activated carbon resulting in discoloration. Acid/water soluble ash content is more significant than total ash content. Soluble ash content can be very important for aquarists, as ferric oxide can promote algal growths, a carbon with a low soluble ash content should be used for marine, freshwater fish, and reef tanks to avoid heavy metal poisoning and excess plant/algal growth. Measurement of the porosity of an activated carbon by the adsorption of saturated carbon tetrachloride vapor. The finer the particle size of an activated carbon, the better the access to the surface area and the faster the rate of adsorption kinetics. In vapor phase systems, this needs to be considered against pressure drop, which will affect energy cost. Careful consideration of particle size distribution can provide significant operating benefits. The most commonly encountered form of chemisorption in industry, occurs when a solid catalyst interacts with a gaseous feedstock, the reactants. The adsorption of reactants to the catalyst surface creates a chemical bond, altering the electron density around the reactant molecule and allowing it to undergo reactions that would not normally be available to it. Adsorption refrigeration and heat pump cycles rely on the adsorption of a refrigerant gas into an adsorbent at low pressure and subsequent desorption by heating. The adsorbent acts as a "chemical compressor" driven by heat and is, from this point of view, the "pump" of the system. It consists of a solar collector, a condenser or heat-exchanger and an evaporator that is placed in a refrigerator box. The inside of the collector is lined with an adsorption bed packed with activated carbon absorbed with methanol. The refrigerator box is insulated filled with water. The activated carbon can adsorb a large amount of methanol vapors in ambient temperature and desorb it at a higher temperature (around 100 degrees Celsius). During the daytime, the sunshine irradiates the collector, so the collector is heated up and the methanol is desorbed from the activated carbon. In desorption, the liquid methanol adsorbed in the charcoal heats up and vaporizes. The methanol vapor condenses and is stored in the evaporator. At night, the collector temperature decreases to the ambient temperature, and the charcoal adsorbs the methanol from the evaporator. The liquid methanol in the evaporator vaporizes and adsorbs the heat from the water contained in the trays. Since adsorption is a process of releasing heat, the collector must be cooled efficiently at night. As mentioned above, the adsorption refrigeration system operates in an intermittent way to produce the refrigerating effect. Helium gas can also be "pumped" by thermally cycling activated carbon "sorption pumps" between 4 kelvins and higher temperatures. An example of this is to provide the cooling power for the Oxford Instruments AST series dilution refrigerators. 3He vapor is pumped from the surface of the dilute phase of a mixture of liquid 4He and its isotope 3He. The 3He is adsorbed onto the surfaces of the carbon at low temperature (typically <4K), the regeneration of the pump between 20 and 40 K returns the 3He to the concentrated phase of the liquid mixture. Cooling occurs at the interface between the two liquid phases as 3He "evaporates" across the phase boundary. If more than one pump is present in the system a continuous flow of gas and hence constant cooling power can be obtained, by having one sorption pump regenerating while the other is pumping. Systems such as this allow temperatures as low as 10 mK (0.01 kelvin) to be obtained with very few moving parts. Activated carbon is used in gas purification, gold purification, metal extraction, water purification, medicine, sewage treatment, air filters in gas masks and filter masks, filters in compressed air and many other applications. One major industrial application involves use of activated carbon in metal finishing field. It is very widely employed for purification of electroplating solutions. For example, it is a main purification technique for removing organic impurities from bright nickel plating solutions. A variety of organic chemicals are added to plating solutions for improving their deposit qualities and for enhancing properties like brightness, smoothness, and ductility. Due to passage of direct current and electrolytic reactions of anodic oxidation and cathodic reduction, organic additives generate unwanted break down products in solution. Their excessive build up can adversely affect the plating quality and physical properties of deposited metal. Activated carbon treatment removes such impurities and restores plating performance to the desired level. It is thought to bind to poison and prevent its absorption by the gastrointestinal tract. In cases of suspected poisoning, medical personnel either administer activated charcoal on the scene or at a hospital's emergency department. Dosing is usually empirical at 1 gram/kg of body weight, usually given only once. Depending on the drug taken, it may be given more than once. In rare situations activated charcoal is used in Intensive Care to filter out harmful drugs from the blood stream of poisoned patients. Activated carbon has become the treatment of choice for many poisonings, and other decontamination methods such as ipecac-induced emesis or stomach pumps are now used rarely. While activated carbon is useful in an acute poisoning situation, it has been shown to not be effective in long term accumulation of toxins, such as with the use of toxic herbicides. Allows certain drugs/toxins to be drawn out of the blood and bind to the charcoal in the intestine—a kind of "gut dialysis"
Incorrect application (for example, into the lungs) results in pulmonary aspiration which can sometimes be fatal if immediate medical treatment is not initiated. The use of activated charcoal is contraindicated when the ingested substance is an acid, an alkali, or a petroleum product. As an over-the-counter drug, it is often used to treat mild diarrhea. Filters with activated carbon are usually used in compressed air and gas purification to remove oil vapors, odors, and other hydrocarbons from the air. The most common designs use a 1 stage or 2 stage filtration principle where activated carbon is embedded inside the filter media. Activated charcoal is also used in spacesuit Primary Life Support Systems. Activated carbon filters can be used to filter vodka and whiskey of organic impurities. Since the activated carbon does not bind well to alcohols, the percentage of ethanol is not significantly affected, but the carbon will bind to and remove many organic impurities which can affect color, taste, and odor. Activated carbon, often impregnated with iodine or sulfur, is widely used to trap mercury emissions from coal-fired power stations, medical incinerators, and from natural gas at the wellhead. This carbon is a specialty product but is often not recycled. The mercury-laden activated carbon presents a disposal problem. If the activated carbon contains less than 260 parts per million (ppm) mercury, Federal regulations allow it to be stabilized (for example, trapped in concrete) for landfilling. However, waste containing greater than 260 ppm is considered in the "high mercury" subcategory and is banned from landfilling (Land-Ban Rule). This material is now accumulating in warehouses and in deep abandoned mines at an estimated rate of 1000 tons per year. ↑ M. Eddleston, E. Juszczak, N.A. Buckley, et al., Multiple-dose activated charcoal in acute self-poisoning: A randomized controlled trial, Lancet 371 (9612): 579. ↑ C. Elliott, T. Colby, T. Kelly, and H. Hicks, Charcoal lung. Bronchiolitis obliterans after aspiration of activated charcoal, Chest 96 (3): 672–674. Bansal, Roop Chand, and Meenakshi Goyal. Activated Carbon Adsorption. Boca Raton: Taylor & Francis, 2005. ISBN 978-0824753443. Marsh, Harry, and F. Rodríguez-Reinoso. Activated Carbon. Amsterdam: Elsevier, 2006. ISBN 978-0080444635. Yang, R. T. Adsorbents: Fundamentals and Applications. Hoboken, NJ: Wiley-Interscience, 2003. ISBN 0471297410. Engber, Daniel. How Does Activated Carbon Work?. Slate. Harris, Peter J.F., et al. 2008. Imaging the atomic structure of activated carbon. J. Phys. : Condens. Matter 20:362201. This page was last modified on 26 July 2018, at 18:50.